Our Watch Foodie Network Video Chat Room never closes! Feel free to drop in with fellow foodies to chat anytime about food, drink, travel and culture. Chat about our videos, chat about your favorite celebrity chef shows, host your own cooking show, or have a virtual dinner party. You're only limited by your own imagination! The chat guidelines are simple: keep it clean and free of profanity and have fun! Check our Calendar for upcoming scheduled video chats. Video chatting online is one of the most rewarding and fun experiences you can do online. Paltalk allows you to video chat and join chat rooms with anyone in the world for free. Be everywhere at once! Text chat with your AOL, MSN, Y!, Gchat and Facebook friends right from the Paltalk Pal list. Add audio and video just by sending them a simple SuperIM link. A little camera shy? No problem. You can opt to omit the video and only add audio, or just chat in text mode. Be yourself! Express your personality with different fonts, effects and hundreds of emoticons in group or one-on-one chats. Paltalk is free to try and in a limited form is always free to use, so download yourself a copy and join in on the chatter. If you'd like to jump in and join the conversation, remember to wait your turn and click and hold the Push to Talk button. Friendship: You will be amazed how quickly you will form friendships. Broaden Your Mind: Running into people from all walks of life and from countries spread right across the globe will expose you to different points of view that will help you form a more solid understanding of the way the world works. Have A lot of Fun: Video chat communities are fun places to hang out. You can join in celebrity chats, spend hours talking about “whatever floats your boat” and just have a good laugh hanging out with friends. Never Alone: Whether you are located in an isolated region, snowed in, feeling blue or just plain bored, a vibrant community of people are waiting for you on the other side of your monitor. Learn Something New: A world of advice and information is available in video chat rooms, whether you are looking to get help on a specific project or are just interested in a particular topic, you will find a community of video chatters willing to help out. Voice Your Concerns: You may be surprised to learn that debate-style rooms are very popular. Whether its politics, religion, UFO’s, Conspiracy, environmental or the meaning of life in general, there are many rooms where you can join in and voice your concerns about whatever issue is bothering you. Explore your passions: You are bound to find many kindred spirits sharing the same passions as you. Love is in the air: Yep lots of folks are finding love over the web cam, you won’t believe how many people that wouldn’t give you a second look in a bar will gladly have a chat with you on a video chat community, then once they get to know you, let your mojo do the rest. Once cringed about, it has become quite the “norm” for people to meet each other via online communities. Stay in touch with loved ones and friends: Great for loved ones and friends who are separated by distance, your loved ones are only as far away as your pc / laptop. Seeing the smiling faces of your friends and family while hearing their voices will make you wish you would never have to use the phone again. Be yourself: In today’s society it’s hard to be yourself, perhaps you're a bit of a geek or have off center opinions, perhaps your shy? Well in video chat communities you can be yourself and just relax, you will soon find others who think just the same way you do. Our video chat room is open 24/7/365. With Paltalk you can webcam chat with up to 10 people at once with rich video, audio and text—free. Follow the below instructions and you will have access to our room 24/7/365. 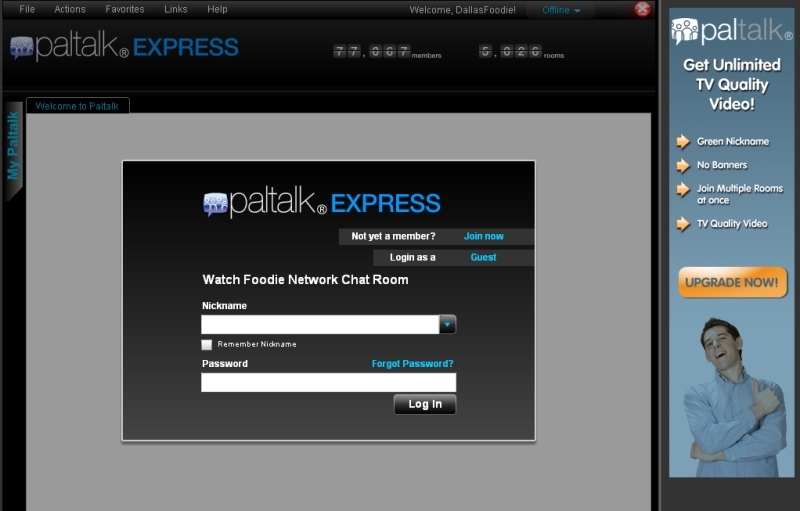 Click on our Paltalk video chat room image displayed here to the right. If you are not already a member of Paltalk, you will need to register for free. Otherwise, just sign into your existing account. New Paltalk Members: When registering for the first time, enter the word foodie in the unlabeled box between Email Address and the Security Question drop-down menu tab. Returning Paltalk Members: When you sign in, our Room Password is foodie. All Paltalk Members: Click on the Actions tab in the upper right corner of the Paltalk Express window. Select Find or Add a Pal from the drop-down window. Type FoodieNet in the box beside Enter a Paltalk Nickname, and click on Search. Select FoodieNet and then click on Add a Pal. FoodieNet will be added to your Pal List. Close the Add a Pal window. When the Room Join Failed window pops up alerting you to the fact that the chat room is closed, just click on OK.
Click on the Actions tab, and select the Join a Chat Room as Admin from the drop-down menu. Select FoodieNet from the drop-down tab to the right of Room Owner, and enter 2012 in the Admin Code box. You are now the Host/Adminstrator of the chat room for the duration of your event. If you want to host/moderate a video chat, would like to suggest a topic of discussion, or would like to request that we repeat a past discussion, please use the form below.